Google has confirmed it will hit its target of offsetting 100% of the energy used at its data centres and offices against power from renewable sources. The firm first made the commitment in 2015 to go 100% renewable by 2017. In a blog, the company said it was now the largest corporate buyer of renewable energy in the world. Fossil fuels are still used by Google, but now it buys enough electricity from renewable sources to offset energy use at the data centres and offices. Its 13 data centres alone consumed around 5.7 terawatt-hours (TWh) of electricity a year. "Over the last six years, the cost of wind and solar came down 60% and 80% respectively, proving that renewables are increasingly becoming the lowest cost option," said Urs Holzle, senior vice president for technical infrastructure. He added: "Since the wind doesn't blow 24 hours a day, we'll also broaden our purchases to a variety of energy sources that can enable renewable power, every hour of every day." Of course the big incentive for a company like Google to hit this kind of target is the bounty of tax incentives offered by the US government (and others) for investing in clean energy. But with incoming President Donald Trump seemingly dismissive of climate change - even calling it a "hoax" in a tweet - those rewards may be coming to an abrupt end. Ahead of today's news, I spoke to Gary Demasi, the man in charge of Google's strategy for energy. He said the company isn't worried. "Incentives have been a valuable way, historically, of getting these projects built," he told me. "The tax incentives still make a difference and they're still important. They are scheduled to decline over the next few years. We have been on record acknowledging that we're not concerned about that reduction - largely because the costs of the technology are coming down anyway." The move by Google has been welcomed by Friends of the Earth (FoE). "Google has come up with the right answer: investing in renewable power is good for business and good for the planet," said FoE energy campaigner Alasdair Cameron. 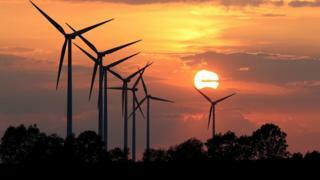 He added that he believed companies, cities and even entire countries will switch to 100% renewable sources of energy. In 2010, Germany's environment agency noted that the country could be 100% powered by renewable energy sources by 2050, for example. Google's news comes at a time when the US President-elect Donald Trump is under pressure from US companies not to abandon the Paris climate deal. Mr Cameron is also calling on the UK government to follow in the footsteps of Google and to continue to invest in renewable energy sources.